WHITTIER >> Santa Fe High School, after coming up short last season, took the early advantage Wednesday in the race for the Del Rio League baseball title. Robert Lucia tossed a one-hitter and Angel Delgadillo scored on an errant throw in the fifth to lead Chiefs to a 1-0 victory over defending champion California at Rio Hondo College. Lucia also struck out eight and walked just one for the Santa Fe, which improved to 7-7 overall and 2-0 in league play. Josh Lambert gave up five hits and an unearned run for the Condors, who slipped to 8-6 and 1-1. 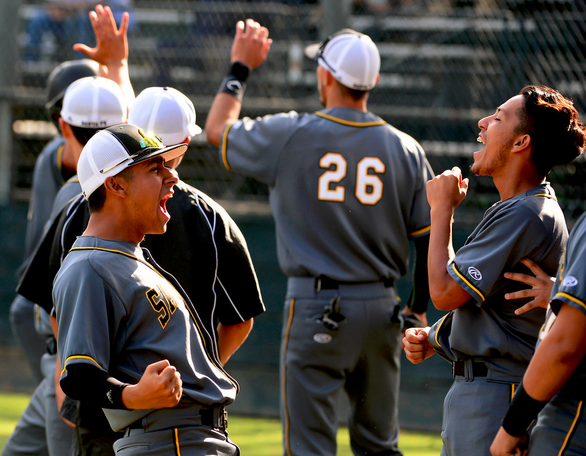 Santa Fe, which had runners on during the first four innings, finally broke through in the fifth. The Chiefs, after singles by Erik Espinoza and Jorge Centeno, had runners at first and third with two outs. Raul Ramirez then hit a grounder to short, which resulted in an errant throw to second that allowed Delgadillo to score for a 1-0 lead. Lucia took it from there. He gave up a single in the first and a walk in the second before retiring the next 12. Cal had a chance to tie in the seventh. Jake Carmichael led off with a hit by pitch and was sacrificed to second. Mike Elliott then hit a fly to right field that was dropped by center fielder Jakob Huerta, but he quickly recovered and threw out Carmichael at third. Elliott took second. Lucia then ended it when he induced Eric Sotelo to ground out.